about their new single, Tell Me, and the story behind it. I ask the Sheffield band what the vibe is like there and whether the North gets the respect and focus it deserves; which upcoming acts we should keep a peek out for – they reveal what tour dates are coming up. I ask Homesteads how they got together and, given the chance, which artist they’d like to support; whether there is any time to chill away from music – the guys each pick a song to end the interview with. With a busy list of dates for our tour, that we’ve kicked off, combined with the glorious weather we’ve been having; it would be hard to say our week has been anything other than great. 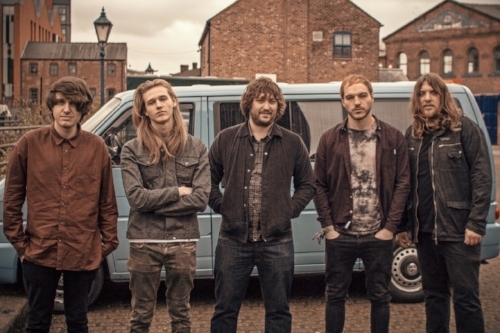 We are Homesteads; a five-piece English Rock band from Sheffield. When it comes to songwriting, we are all about the bottom line; memorable and uncompromising anthems - behind the wall of Rock energy that we dedicate ourselves to writing; the kind of choruses you love stumbling home humming to at 3 A.M.! Myself (Ash), Aaron and Alex started off in an awful covers band and we just got sick of playing other people’s songs and formed Homesteads in 2014. At first, we were very Alt-Rock/Americana but we always felt we were lacking presence. We brought Jack in and Josh started to develop the supermassive Rock sound that we have today. Tell Me is your new single. Can you reveal the inspiration behind the song? With a strong sense of laid-back urgency and a roaring guitar tone, Tell Me lays the perfect foundation for something that makes you want in, right down to main chorus line: “Tell me/Am I still going your way?” This song is not going anywhere and it wants to stand out. There is nothing more current than questioning the status quo, but it’s not just the punks in this day and age. There is a bigger state of questioning at the moment and society is starting to noticeably reflect and adjust itself. It seems like you’re in a creative and productive mode right now. Do you think there might be more material coming later in the year? We always have a backlog of material included in our set. This helps the song really find its place and evolve over time. At the minute, we keep releasing a song at a time and then gigging around it. We're always looking to improve our writing - that is a big part of what drives us to gig and get our music to the masses. A lot of time, creativity and bloodshed are put into the songs and I think that really shows. In short, the answer is ‘yes’. Stay tuned. Being based in Sheffield; how do you view the current scene there? Are there are a lot of great acts coming through? I would say there are plenty of decent bands out in Sheffield but I don’t think the scene is anywhere near as strong as places such as Manchester and Liverpool. We have discovered this as we are starting to play outside of our hometown more. Bands seem to be more invested in working together in other areas and we’ve found people to be generally more supportive - but that’s just based on our experience. If there is a scene in Sheffield, I’m sure the three of them will let you know. Do you feel the media gives the North the attention and respect it deserves? Do you feel music is too London-centric at the moment? I don’t particularly think the issue is a lack of regional attention. I think it is more that the media neglects to cover upcoming bands. They focus on bands that have already broken through instead. I understand, to some extent, why this happens because, as the media, you will always focus on what gets you the most attention. It’s a problem that is very hard to find a solution for. Can you give me an idea of the music that inspires Homesteads? Which artists do you all favour and follow? We’ve got very different tastes as individuals but I would say the core of our sound draws from Stereophonics, Manic Street Preachers; The Beatles, Led Zeppelin and generally from a lot of English Rock bands through the decades. We hope to have imprinted our band’s name on the inside of everyone’s eyelids to a point where ‘Homesteads’ rolls off of the tongue as easily as ‘Love Island’ and ‘Danny Dyer’. If we find any time in between, I’d like to laugh in Pierce Morgan’s face till he finally caved in and cries in a puddle of his own phone-tapped tears. Playing to a full room at Fulford Arms in York. It was a massive buzz and it’s always great when the crowd gets involved. Nothing worse than playing in a pub to a bunch of mardy people with no energy who has already given up on life. It would be too easy to say something generic: there are too many great Rock bands to name just one. I’d rather choose someone that we could upstage, but they’d still be sound about it because they’re too chilled to give a s**t . Like James Blunt. The rider would be ginger biscuits served by Ed Sheeran because I could constantly use the quote “Another ginger from the ginger” and he’d love the attention - but I don’t want him playing any of his songs because James Blunt would upstage him to be honest. We are on tour at the moment - and the dates are above. Make sure you love what you do because you will have to do a lot of it for free for a long time. The Blinders, SHEAFS; Thomas and the Empty Orchestra and Hot Soles. Hardly. I think, when you dedicate yourselves to making music, that’s what you do to unwind.